The New Year is here! For many homeowners, that means cleaning and organizing to start 2019 off on a good foot. Although you may have the best of intentions, you could be making some common cleaning mistakes. By trying to take shortcuts, you may actually be creating more work for yourself. Let’s take a look at what those bad cleaning habits may be and offer some solutions for how to tackle them. We know you want to get the job done well and quickly, but heading straight to the harshest products isn’t necessarily good in the long run. Many of those products can be toxic to you, your family, your pets, and the environment, especially if you’re exposed to them often. Unless you have an extreme situation, switch to gentler, natural products that are safer to use. Extra product makes things extra-clean, right? Unfortunately, that is not the case. When you use more product than is necessary, like laundry detergent, you end up spending more time cleaning the product off. If you don’t, you leave a residue behind that actually attracts more dirt and grime. Pay attention to labels for the recommended amounts, and use that amount or less. You may think your cleaning tools are clean because you use them for cleaning. But chances are those tools are pretty dirty. 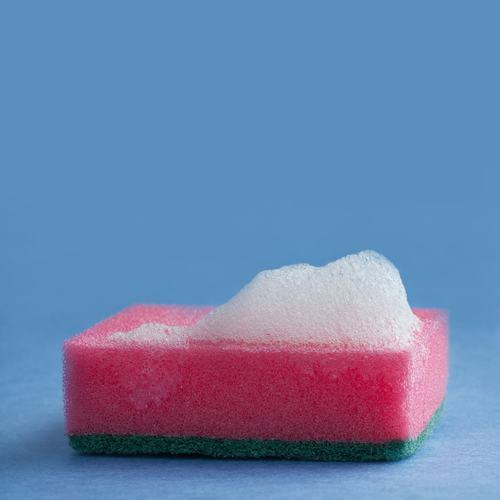 In fact, your kitchen sponge is a hotbed of bacteria. If you’re not careful, you could just be spreading more bacteria around when you use it. The same goes for your vacuum cleaner. If it’s filled with dust and debris, you’re just blowing it around your home when you use it. Also keep an eye on your washing machine. If it gets a funny smell, you’re likely using too much detergent and causing bacteria to build up. If you’re vacuuming your rooms before you dust them, then you’re not cleaning as well as you could be. When you clean up dust, it tends to float into the air and eventually reaches the ground. If you vacuum before you dust, then those dust particles will remain on the floor until the next time you clean. The best rule of thumb is to clean rooms from the top down, and finish by vacuuming. Don’t you hate having a moldy shower curtain? You can keep it from attracting mildew by closing it after you shower. When you leave your shower curtain open, the water in the folds doesn’t dry quickly. Over time, mold and mildew will develop. The same goes with your bath mat. Hang it up to dry after each use so that it doesn’t get moldy. Finally, one of the worst cleaning habits we all have is waiting too long to clean. It’s so much easier to tackle a little bit of cleaning every day instead of waiting until the task becomes so overwhelming that you don’t want to do it. Do yourself a favor, and make a resolution for 2019 that you’ll clean a little every day instead of waiting to clean the whole house at one time.